I am back in Thessaloniki this evening, and I plan spending Orthodox Good Friday and Easter in the second city of Greece, with a visit to Mount Athos on Saturday. This is my third time in Greece within the past 12 months, having spent two weeks in Crete in June and July and enjoyed a city break in Athens in August. But this is my first time back in Thessaloniki since October 2011. I caught an early morning flight from Dublin today, and there was a two-hour wait in Frankfurt for the flight to Thessaloniki, where I arrived in the early afternoon. From Makedonia Airport, it was a 12 km journey to the Minerva Premier Hotel on the corner of Egnatia Street and Singrou Street in the heart of Thessaloniki. This is a small hotel built in the neoclassical style 1929 and was renovated recently. Egnatia Street is the busiest main street in central Thessaloniki, and I am close to the city’s, restaurants, shops and nightlife. 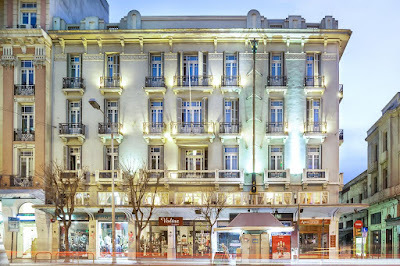 The Minerva Premier Hotel is at the western end of Egnatia Street. Further east, half way along this long street are the Arch of Galerius and the Mount Athos Pilgrims’ Bureau. It is just a five-minute walk from the hotel to the Church of Panagia Chalkeon, the Jewish Museum of Thessaloniki, the Roman Agora and the main historical sites, including old Byzantine churches and monuments that reflect the 2,500 years of history that have shaped and made Thessaloniki. Aristotelous Square, the Church of Hagia Sophia are close by and I am just minutes from the Paralia or seafront promenade, lined with cafés and shops. I was last in this beautiful city in 2011. But I have been here at least half a dozen times before, and I have written travel reports on Thessaloniki, reviews of books and exhibitions, and features on its Byzantine and Jewish heritage. I was here in 2004 when I first visited Mount Athos, and I was here in 1997 when the Ecumenical Patriarch visited and delivered a lecture in the Aristotelian University, and when Thessaloniki was the European Capital of Culture. I have also passed through Thessaloniki on the way to or from Athens and Rhodes. Thessaloniki (Θεσσαλονίκη), with a population of over 350,000, is the second largest city in Greece and one of the oldest cities in Europe. It stretches over 12 km in a bowl formed by low hills facing the bay that opens into the Gulf of Thermaikos. Thessaloniki is said to have been founded about 315 BC on the site of old prehistoric settlements dating back to 2300 BC. Cassander, King of Macedonia, named his new city after his wife, Thessaloniki, the sister of Alexander the Great. Since then, Thessaloniki has become the principal city of Macedonia and its most important commercial port. In Roman times, it was visited by the Apostle Paul, who preached here and who addressed two of his epistles (I Thessalonians and II Thessalonians) to the early Christians in Thessaloniki. My grandfather, Stephen Edward Comerford (1867-1921), died in hospital on 21 January 1921 after he contracted malaria in Thessaloniki during World War I. He had been shipped to the Balkans in 1915 along with thousands of other men from the Royal Dublin Fusiliers. After he was struck with malaria, he was shipped back to Ireland from Thessaloniki and was discharged on 3 May 1916, only three days after the Easter Rising ended in Dublin. Malaria saved him from further action in World War I and probably saved his life, albeit briefly. His early homecoming was fortuitous for the Comerford family and for me … otherwise, my father would never have been born. It is coincidental then that Thessaloniki has long been one of my favourite Greek cities. Like Milan, Cork, Kyoto, and many other cities, this city exudes the casual but elegant confidence of a second city. It is a relaxed but cultured city, with fine museums, universities and a rich architectural and historical heritage. I am looking forward to a pleasant reacquaintance with this city over the next few days. But most of all I am looking forward to being in local churches for the Orthodox observations of Good Friday and Easter … my second Easter this year.